South Caradoc is planning to lure visitors to its special corner of the world along the Thames River with a path of barn quilts. Thirty people attended tonight’s meeting at the South Caradoc Community Centre to learn about the power of barn quilts to tell a community’s story. Denise Corneil and Mary Simpson accompanied by quilters Sue Ellis and Eleanor Blain from Wardsville told the story of Mr. and Mrs. George Ward, the founders of Wardsville in 1810. Wardsville celebrated its bi-centennial by creating a 30-block story quilt. Then, volunteers painted each block on an 8 foot square “canvas” and mounted the barn quilts on their local barns and significant places. 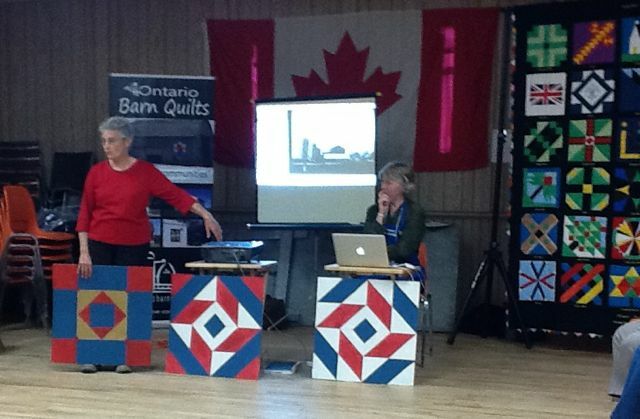 Wardsville volunteers had a lot of fun with the project and have enjoyed the notoriety of being the second community in Ontario to take on a barn quilt project (the first was Temiskaming in 2009). the area two hundred years ago, inspired the locals with historical tidbits about the United Church, the old school, and the Burwell Road. South Caradoc seeks a quilter who might take on a the creation of a quilt, but if not, the community will simply design the blocks and install them on the heritage barns and sacred places. Posted on October 11, 2011, in Establishing a barn quilt trail, Longwoods Barn Quilt Trail and tagged South Caradoc Township, South Caradoc United Church. Bookmark the permalink. Leave a comment.